Keri and Matthew’s downtown St. Pete wedding featured an Alice in Wonderland inspired theme that was one for the story books. The Lutz couple planned every detail to express their personalities throughout their wedding day. 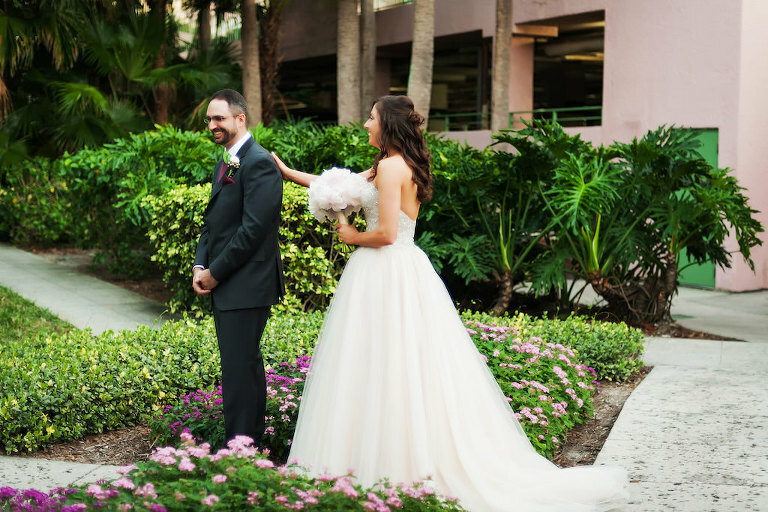 The bride incorporated the Wonderland theme into her attire through her strapless ballgown with a beaded bodice from Tampa wedding dress boutique Truly Forever Bridal. To wow the couple’s closest family and friends, they turned to St. Pete wedding cake bakery The Artistic Whisk to create an abundance of sweets and a custom topsy-turvy cake that matched their theme perfectly. Looking back on their wedding day, the bride described the overall atmosphere as thought provoking and fun. 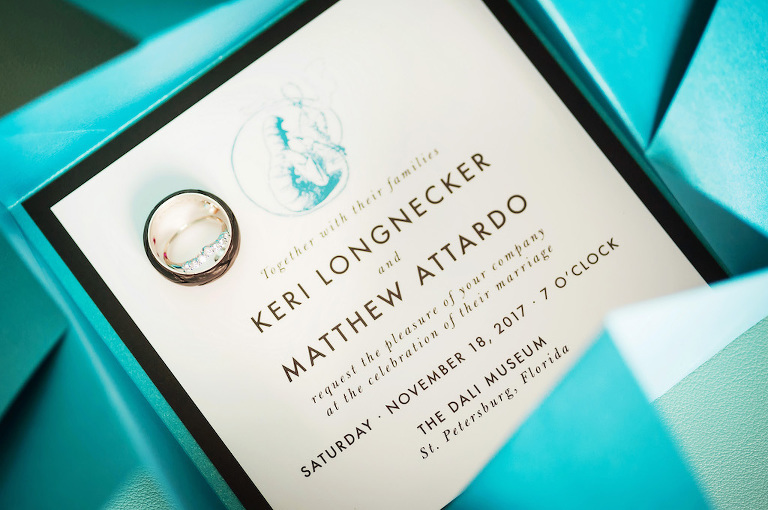 “Having our ceremony and reception at the Dali Museum was an experience for everyone; our guests had the opportunity to view the galleries in a more private setting. Seeing all of our planning and ideas become a reality with all of our closest friends and family together at one spectacular venue made our day feel very intimate and memorable,” the bride reminisced. 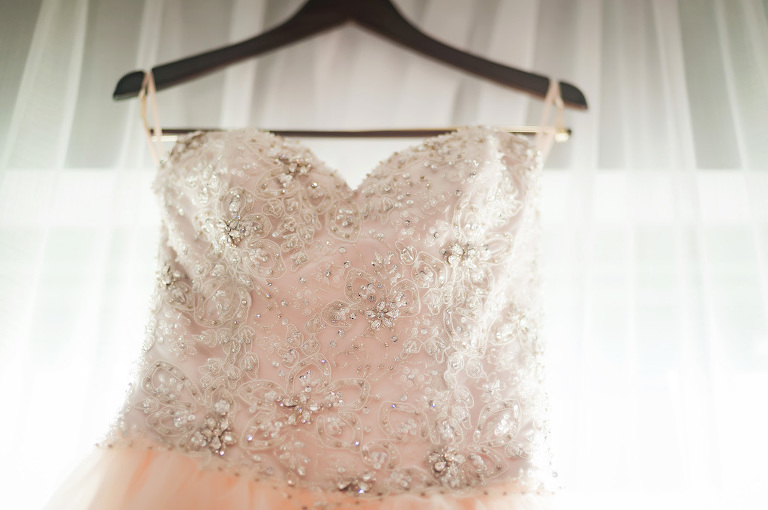 What did you look for in a bridal shop? Warmth and familiarity. Wedding dress shopping is special. I cried when I found the one, and I wouldn’t want to be in a middle of a Nordstrom when that happens. My sister went to Truly Forever Bridal when it was under the name Jon’s Bridal. After visiting many bridal shops in Tampa, I could not get that first dress out of my head. It was the first shop I tried, and the first dress that I tried on. After dating for almost four years, my now husband proposed on 11/11 at 11:11 p.m. at home with an heirloom diamond. It was a tear-shaped diamond that his mother gave him; the diamond was originally from his mother’s great-aunt’s ring. The ring had two twin tear-shaped diamonds and two rubies set in platinum. My mother-in-law now wears a ring with the matching tear diamond. We had the rubies set on the inside of my husband’s wedding band, and I had my engagement ring and wedding band custom made. 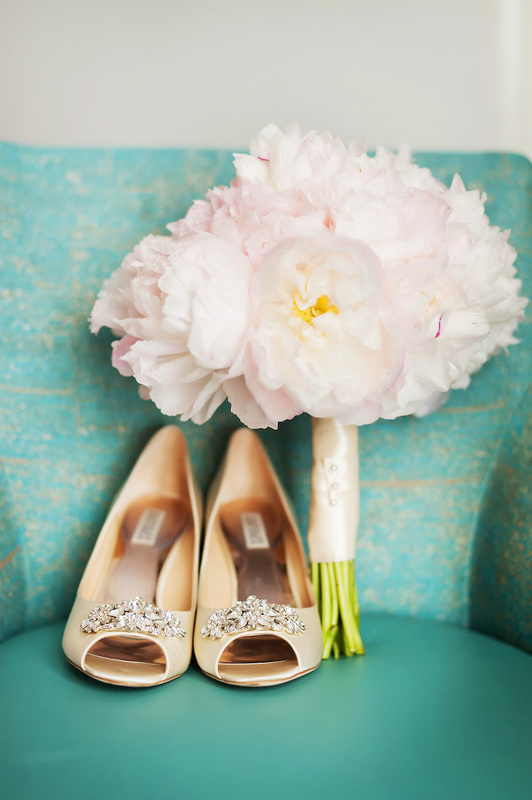 I chose pink peonies for my tables and blush peonies for my bouquet. My dress was a champagne color, and my husband picked burgundy for his tie and pocket square. All the colors happened to work well together. What did you look for in a wedding cake bakery? I needed a bakery that could create what I had pictured in my head. The cake needed to tie the Alice in Wonderland theme together, while remaining elegant. I Want to Learn More about Desserts & Cake from The Artistic Whisk. The Artistic Whisk has the most amazing chocolate chocolate cake we have ever tasted. They use all natural ingredients and imported Swiss chocolate. The cake was visually jaw dropping, and the customer service was exceptional. How did you incorporate you and your spouse’s personalities into the wedding? My husband studied recording arts, show production, and entertainment business. He planned the playlist for the inside foyer and chose a wild video to project on the outside of the museum. © 2019 Marry Me Tampa Bay | Local, Real Wedding Inspiration & Vendor Recommendation & Reviews|ProPhoto Website|Design by Northfolk & Co.